Ten of Ed Gerhard’s most beautiful solo guitar pieces transcribed in full notation and tablature. 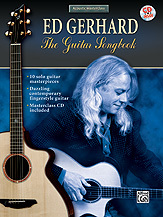 On the accompanying master class-style CD, Ed carefully describes and demonstrates all the key passages for each song. Titles are: Blue Highway * Crow * Duet * Farther Along * Homage * Promised Land * Shallow Brown * Si Bhig, Si Mhor * The Water Is Wide * Wild Mountain Thyme.